I’m David, the Senior Sales Associate here at Landscape Tanks. Today, I’d like to share with you some of the hugely popular and uses for our Landscape Tanks. Some of the applications might not be immediately obvious, so keep reading. When I first discovered the Landscape Tanks many years ago and I was, like many other people, absolutely blown away by how good a plain old water tank can look and the versatility and numerous of uses they serve around the home. 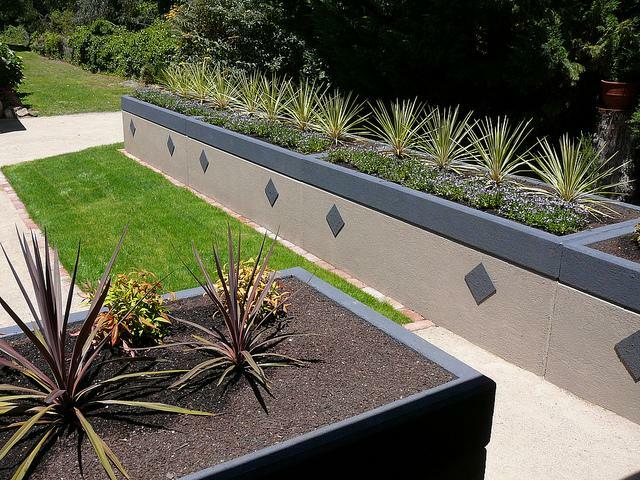 They are made from high quality concrete and can be readily “dressed up” to blend in seamlessly with nearby surrounds and in many cases enhance those surrounds. Without further ado Let’s jump straight into the 5 Best Practical uses. Please skip to the item of most interest to you. Remember all these applications are also water tanks and very cost effective, which is pretty neat. 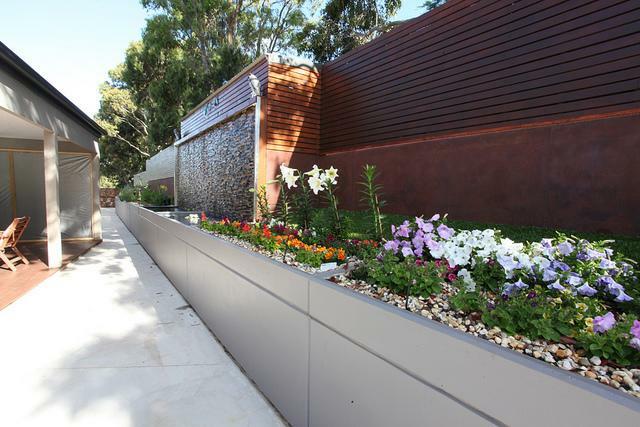 One of the most popular uses for the Landscape Tanks is the humble structural retaining wall. Retaining Walls on a property can really make or break the overall appearance of your Landscape Design, but this doesn’t always have to be the case. The Tanks themselves are modular in nature (just like Lego) and come in three different sizes to accommodate a range of different configurations. They are made from quality concrete which you can blend them in seamlessly by paining them to match your home decor, rendering or even attaching stacking stone to the face of the tanks. Retaining Wall Tank – Dimensions. What’s Involved with Site Preparation and Delivery? The tanks are concrete and very heavy. This is the reason you can just place them into position for an instant retaining wall with no footings required. We use all the equipment designed to lift heavy things. Around 80% of our deliveries use a Hiab/Crane truck. If access is a little tight there are other practical options such as all terrain forklifts, excavators or telehandlers. It is very common for a landscaper to take over and manage the entire delivery and installation. However, if you would like to manage everything yourself that’s fine too. The company has been fine tuning the design of the Landscape Tank to be very easy to install, believe it or not but mum’s and dads put these in regularly. What do have to do to get ready for the tanks? Landscape Tanks and delivery contractors will run your though all the things involved with delivery well in advance. Items such as access and how steep the block is come into play for delivery. Landscape Tanks need to be placed on a firm level base – no footings. For a site well prepared it should take you around 20-30 minutes to place each tank into position. This results in instant, lasting, stunning results for homeowners and landscapers. The Landscape Tanks are also very popular among “time sensitive” builders and developers working to a strict deadline. 1They also make homeowners and builders less dependent on “tradies” for installation, as they are often hard to find these days. Tanks are connected using a cast-in rubber 50mm “O” ring seal so simple a six your old child can join the tanks together. The rest of the plumbing is the same as a normal tank. Engineering – council permits -HASSLE FREE. In a further adaptation of their great design the tanks take all the hard work out of things as they come pre-engineered with their own engineering drawings for handling to council if applicable. 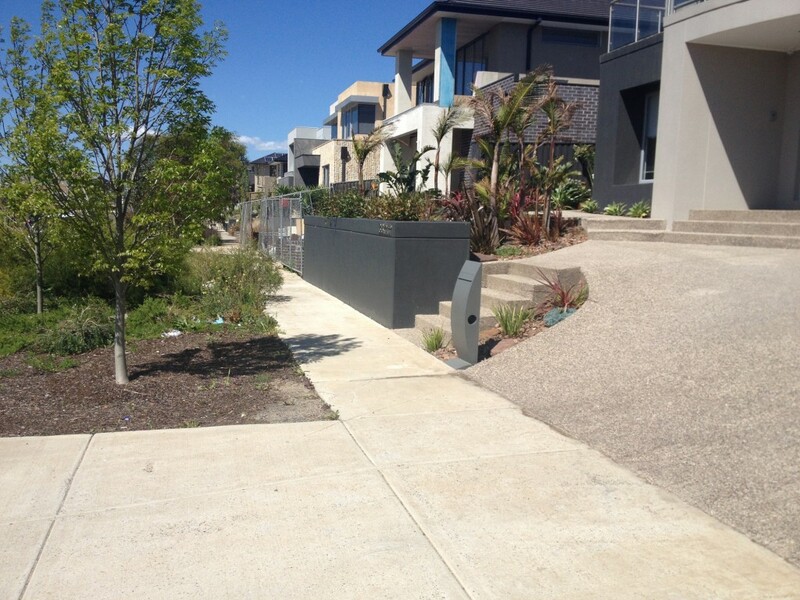 All retaining walls require council permission – usually when they are one 1m but always check. The Landscape Tanks are designed to last a lifetime. Utilises Wasted Space Behind Front Fence. Ever looked out your front window and notice just how much space that garden takes up immediately behind your front fence in your front yard. We I do and that’s why I have Landscape Tanks as my front Fence. I have turned that wasted space into my bulk water storage for my property. Mine are also a retaining wall as my front fence. I could not believe just how great they look. They offer great protection from cars and trucks especially when full of water – very heavy. They are a bollard in their own right. Less work, less time and less effort all compound into a very cost effective quality product. All the retaining Wall specifications also apply for front fences. #3 Raised Garden Beds – Back Saver! All of the Landscape Tanks planter tops sit directly on top of the water tank that’s underneath. All of the water from the planter top drains externally to the base and no sealing between the two is required. You can also install stunning water features within the planter top, seating or day beds around pools. There is a standard planter top (featured in the above image) and a DEEP Planter Top Upgrade that provides an additional 10cm of soil depth. OSD Systems Explained – IMPORTANT to Note. Forgive me if this is a bit long winded but it is important that people understand what an OSD System is and the implications if they are building or extending. Understanding about an OSD system at the outset may save you tens of thousands of dollars on the build. 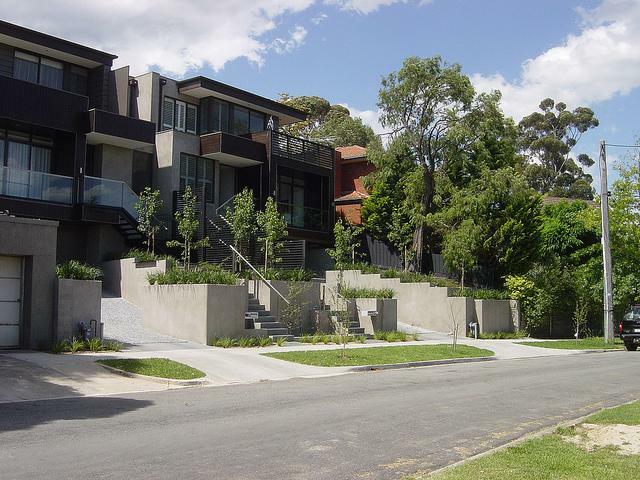 The ever-expanding metropolitan areas in recent years, has seen more and more run off water from hard surfaces, such as large roof areas and concrete or paving, finding its way into the council stormwater catchment. This infrastructure is often old or undersized and unable to cope and serious flooding can eventuate. The only way to “even out” water runoff water from these new developments is to store rain water on site somehow. This is not easy and can be extremely costly. Many people fail to allow for the cost of their OSD system in their budging causing severe issues. Complicated and hugely expensive OSD systems have found their way into the marketplace as developers and home owners grapple with the complexities of an OSD system for their dwelling and where to locate it so it complies with council regulations. Many hydraulic engineers opt to place the OSD system under the driveway, but at a huge cost as the systems are large and complicated to build. They alternatively design an OSD Basin, which is an eyesore similar to an above ground pool located somewhere on your property to hold and release water slowly. Almost all systems are highly costly and problematic. Building them is difficult and finding tradies who know how to build them is also becoming very difficult. Landscape Tanks offer a Great Alternative Solution. Once again, the Landscape Tanks designers have done a great job and adapted the Landscape Tanks for use as a very cost effective OSD systems. Save a Bundle – You may not Even Need a traditional OSD System At All. 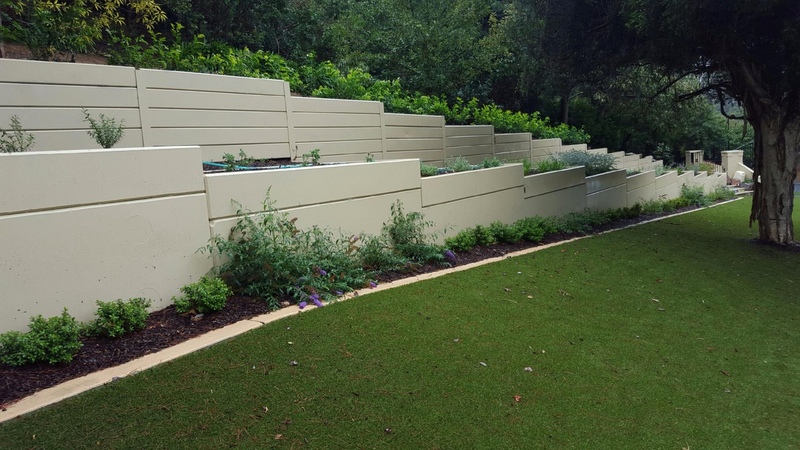 The Landscape Tanks OSD system (patent pending) has been designed to incorporate an OSD system into your structural Retaining Wall, Front Fence or Pool Surround or even raised Garden Bed. That means that for the cost of your retaining wall, you also have an inbuilt OSD system for very little additional cost. Big Bonus. Ensure your plans include the Landscape Tanks prior to going to council. We can help in this regard. The traditional water tanks can be extremely ugly and quite the eyesore, they don’t have to be! It’s quite common for people to pay a fortune for underground options or try and hide their water tanks around the side of homes taking up prime space. Slimline poly tanks also have a lifespan and sometimes prone to split’s and leaks after 5 years. You now have the option to turn your Water Tank into a main Feature with the popular Landscape Tanks.